development and said that it was long over due. “The upgrade of the airport was first approved in 1971 prior to independence when a decision was made to make Madang the alternate international airport in PNG.” Sir Peter said that the shuffling of the government following the country’s independence caused the delay. 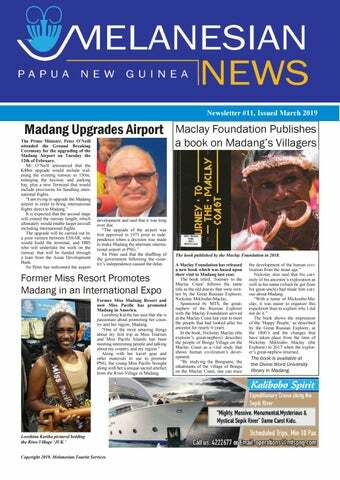 Former Miss Resort Promotes Madang in an International Expo Former Miss Madang Resort and now Miss Pacific has promoted Madang in America. Leoshina Kariha has said that she is passionate about promoting her country and her region, Madang. “One of the most amazing things about my first trip as Miss Tourism and Miss Pacific Islands has been meeting interesting people and talking about my country and my region.” Along with her travel gear and other materials to use to promote PNG, the young Miss Pacific brought along with her a unique sacred artefact from the Riwo Village in Madang. the development of the human civilization from the stone age.” Nickolay also said that his curiosity of his ancestor’s exploration as well as his name (which he got from his great-uncle) had made him curious about Madang. “With a name of Mickouho-Maclay, it was easier to organize this expedition than to explain why I did not do it.” The book shows the impression of the ‘Happy People,’ as described by the Great Russian Explorer, in the 1800’s and the changes that have taken place from the time of Nickolay Miklouho Maclay (the Explorer) to 2017 when the explorer’s great-nephew returned. The book is available at the Divine Word University library in Madang. An Artist’s Impression of MTS’ newly proposed e-Niugini Discoverer. A vessel that has 4 decks and can carry 50 pax. fuel which is in line with the Government’s policy on global warming. Whilst the vessel is smaller than the mega tourist ships, the proposed new vessel will have a distinct advantage of being able to visit more remote areas, this is through MTS’ relationship with the people that has been built up over 50 years and respect for cultural values. This distinct advantage will provide visitors with a unique way of seeing PNG, both above and below water as the ship will carry fast river trucks, a helicopter and will also be equipped to provide snorkelling and scuba diving. The vessel will offer 30 twin and double cabins, all with en-suites, picture windows, in-house and satellite TV, Telephone, gift shop, dining salon, lounge including a covered aft bridge deck and bow lounge. Sir Peter said that the general layout of the vessel will be similar to the former Melanesian Discoverer. “The vessel will be similar to the old Melanesian Discoverer, which has operated successfully in the past,” he said. “Melanesian Discoverer has operated successfully on scheduled cruises along the Sepik River and the islands and ports around PNG,” said Sir. Peter. experience in pioneering tourism through PNG – MTS firmly believes that the smaller expeditionary ships visiting PNG are a better option than the Mega Ships bringing thousands of tourists that tend to invade small islands and villages and leave very little behind. The e-Niugini Discoverer will be crewed by PNG Nationals, assisted by national and international experts to impart their knowledge to the visitors. It will also operate year-round on a scheduled basis and will include the Sepik River, Bismarck and Milne Bay Islands and coastal ports and have the ability to take guests inland aboard the helicopter which will be based aboard the vessel. Sir Peter also added that he was considering a full circumnavigational cruise round New Guinea, which of course would include Papua. The e-Niugini Discoverer is expected to be constructed in Thailand and enter service in mid-2020. really enjoyed our conversations with Peter, Busy Bee, the Sunday driver and George - we learned so much about Papua New Guinea - languages, exports, culture etc,” said Teresa. She also thanks the staff for taking time to make her husband and herself fully experience the Madang community. “We especially appreciated Vince arranging for us to walk to Sunday Mass with his wife Rose Mary,” she said. “This too, was a great experience - such a large congregation for an ordinary Sunday! We generally see such a crowd for an event such as Easter or Christmas, this was a very rich Madang experience,” she said. Teresa Cazzulino and her husband at a harbour cruise, a part of the many activities that are part of staying at the Madang Resort and Kalibobo Village. stories of this new instrument which he had learned from his visit to Honiara. “I was surprised to see that the people from my village were eager to learn this new instrument.” Mr. Atip gathered a couple of men from his village and they started preparing bamboos. The sound from the bamboos echoes and travelled across the small lagoon that covered Siar Village, attracting the whole village that followed this mysterious new sound. “They thought it was the Kundu, but it sounded different from the Kundu.” The young men that all gathered and played in front of the village soon became Siar Village’s first Patfun Bamboo Band. Patfun, the name as defined by Mr. Atip, is translated as the rock or the land that Siar Village is located on, “It is the foundation, which is why we decided to use that name.” Patfun became the admiration of many villages as the young bamboo band travelled, taught and wooed villagers along the Bel district of Madang to learn the art of bamboo playing. “It is not ours to be greedy over; we have to teach others, I think that was what those kind bamboo players from Honiara would have wanted.” In 1975 Mr. Atip became a judge for a string band competition. 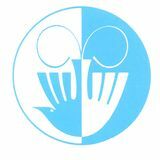 “They said that since I was the founder they would like for me to judge this competition and…. I was humbled by this invitation…”Mr. Atip with smiles trying his best to draw back an emotional side to his character. “It is something that I will always be proud of, it is ours now and it will be Madang’s forever, let the bamboo band live on!” With this comment it was clear that Mr. Atip revealed his passion for the musical instrument. He described it as a child being adopted from another country and to watch the musical instrument blossom in Madang was like watching a child growing up. Humbled and covered in his passion for the instrument, Mr. Atip denies any praise for being the founder of Madang’s bamboo band. “I don’t like to get praised for anything, it is ours and it has made an old man a very happy man to watch and to hear the bamboo being carried by the ocean to and from the islands that surround Madang.” Mr. Atip now aged in his late 60’s still thanks the men from Honiara for being generous with sharing their knowledge with him. Valeri Irma and Valentine Sourin at the Maclay Memorial in 2017. equipment that we used from the Kalibobo Spirit to the machinery that were used at Raicoast,” said Sir. Peter. Sir. Peter hopes that through the influence of the Maclay Foundation in Russia, a lot more Russian Tourists could come to the coast named after their great explorer. The Construction of the Sea-wall at Gorendu, Madang. Picture: The staff of the Madang Resort with their equipment at Gorendu. Harbour promotes Madang and MTS’ image. “Even though these 20 passengers will be spending a night here, they are valuable because they chose to spend their night with us here in Madang,” she said. “MTS provides the best services to not only Europa, but to so many different passenger cruise ships throughout the globe,” she said. MTS has provided the best tourist services to tourists that come into Papua New Guinea and has successfully done so for more than 50 years till today, they continue to do so.